Sterilite underbed storage is one of the best ways to organize clutter out of sight especially when you are limited on closet and dresser space. Someone going off to college? Sterilite under bed storage is a must on the shopping list to store clothing that can't fit in those tiny dorm or apartment closets. Some of the Sterilite underbed storage containers come with wheels so scooting them in and out from under your bed is even easier. 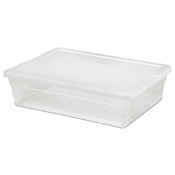 Store multiple Sterilite under bed storage boxes under your bed and your family's beds with bulk pricing at Just Plastic Boxes. 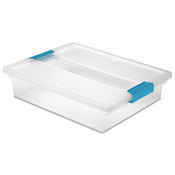 Sterilite underbed storage is also really useful for storing giftwrap or scrapbooking supplies. 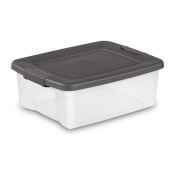 With some having 2-sided hinged lids, it's easy to find what you need without pulling the Sterilite under bed storage box completely out from under the bed. They can come several styles and sizes, but if you can't find quite what you need, give us a call.